Matt Lauer Accused of Sexually Assaulting Colleague During Sochi Olympics“Page Six” says Lauer’s dismissal was prompted by a sexual-assault complaint dating to the 2014 Sochi Olympics. Simone Biles Says She’s Not Ashamed of Her ADHDRussian hackers released her medical files. Laurie Hernandez Has a Flippin’ Good Time Throwing Out a First PitchU-S-A! M-E-T-S! Jimmy Fallon Helps You Say Good-bye to Michael Phelps Olympic Memes, ForeverMichael Phelps the meme has a had a great run. Black Women Dominate the VMAs, and Pop CultureBeyoncé and Rihanna were at the center of last night’s awards, much like Simone Biles at the Olympics. Controversial Soccer Player Hope Solo Goes on ‘Personal Leave’The Seattle Reign FC made the announcement on Twitter. Simone Biles Has Big Plans for the VMAsPrepare yourself for a Simone Biles and Kim Kardashian selfie-athon. Katie Ledecky Makes Man Hold Her Medals While She Throws Out First PitchThe Washington Nationals’ Bryce Harper makes a great medal-hanger. Why Were the Rio Olympics Ratings So Bad?Not even the Olympics are immune to audience erosion. Not to Brag, But American Women Won the Most Medals in RioThey won more medals than most countries. 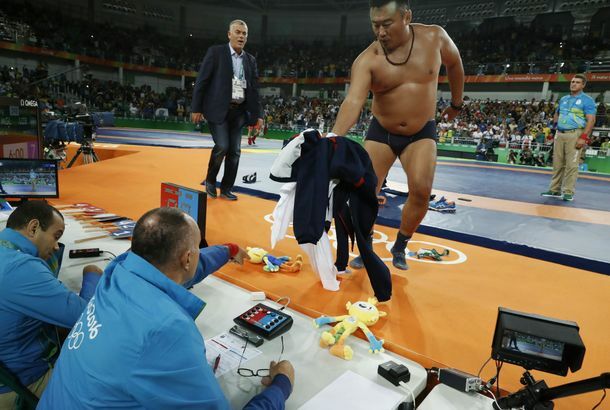 Olympic Wrestling Coaches Stripping on Live TV Is Sadder Than It SoundsUnsurprisingly, the move did not go over well with the judges. Laurie Hernandez Got a Sweet ‘Hello’ From Adam LevineBecause Zac Efron has had his moment. Oily Tongan Flag-Bearer Glistens Once MoreWe’ll miss you, Pita Nikolas Taufatofua, most of all. Everyone Wanted a Selfie With Simone BilesAs one announcer put it, they wanted the “Biles smile,” before going home. U.S. Boxer Claressa Shields Makes History With Second Gold MedalClaressa explains how to be an Olympic legend. What’s on the Olympics Schedule Today: Sunday, August 21Hour by hour. U.S. Women’s Basketball Team Snags 6th Straight Gold Medal, NBDThe team beat Spain 101–72. Ryan Lochte Sits Down for a Matt Lauer InterviewFollowing the announcement of an IOC investigation. Simone Biles Chosen to Be Team USA Flag-Bearer in Olympics Closing CeremonyLeader of the pack. Gunnar Bentz Gives a Statement on LochteGate The jeah thickens. What’s on the Olympics Schedule Today: Saturday, August 20Hour by hour. What It Really Means to Train Like an OlympianIt’s not just their bodies that are strong. Queens Native Is the First American to Win Gold in the Women’s 400-Meter HurdlesDalilah Muhammad once ran around her neighborhood in Jamaica. Lochte Apologizes for Not ‘Being More Careful and Candid’ About Events in RioHis teammate James Feigen agreed to donate $11,000 to have his passport returned. What’s on the Olympics Schedule Today: Friday, August 19thHour by hour. Even Olympic Runners Forget Their Hair TiesHappens to the (actual) best of us. A Helpful Explainer of Ryan Lochte’s International IncidentEverything you need to know about America’s No. 1 fugitive. Olympians Attempt to Sing ‘We Are the Champions’Well, gold for effort. American Women Have Achieved a Ton of Olympic Milestones in RioA few men have, too. Kerri Walsh Jennings Is Fine With a Bronze Medal, Thanks for AskingOlympic bronze: not too shabby. Ryan Lochte’s Robbery Story Is Being QuestionedDetails about Lochte and his teammates’ story has left Brazilian authorities with some questions. Newspaper Labels Photo of Simone Biles ‘Gabby Douglas’Awkward. Watch Zac Efron’s Dreams Come True When He Meets Simone BilesThere’s a lot of screaming involved. All Gold Medalist Kayla Harrison Wanted Was One Dang CheeseburgerCongrats, Olympic gluttons, you pissed off a judo champ. Vince Staples Reviews the OlympicsHe comes down hard on the horses too. Female Olympians Are the Ultimate Shine-Theory IconsAlthough they are pitted against each other for a limited number of medals, they are openly supportive of each other. What’s on the Olympics Schedule Today: Wednesday, August 17Hour by hour. 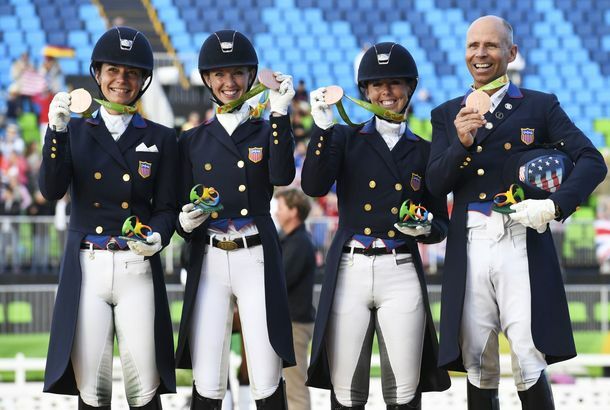 The Olympic Sport for Middle-Aged DreamersIn equestrian, there are Baby Boomers still hunting for medals. Zac Efron Is a Simone Biles Superfan and He Flew All the Way to Rio to Prove ItIs this the beginning of a beautiful friendship IRL? Stop Proposing at the OlympicsEnough already. Olympic Champions’ Minds Are Quieter Than YoursAll-out effort combined with all-out chill. The Politics of Track and Field’s Harsh False-Start RuleIt has claimed more victims at the Olympics. Simone Biles Wins Gold on Floor ExerciseShe leaves Rio with four golds and a bronze. What’s on the Olympics Schedule Today: Tuesday, August 16Hour by hour. Leslie Jones Rallies Support for Gabby Douglas After Online BullyingJones started the #LOVE4GABBYUSA hashtag on Twitter. Michael Phelps’s Medals Weigh More Than His SonBecause he just has that many.